Happy Thanksgiving to all of my American friends and followers. I am thankful to be apart of the fashion community in Second Life and for my amazing sponsors. It has been a bit of a quieter month for me, but fear not…December always tends to get busier! Body: Maitreya – Lara | Skin: Izzie’s – Kayta | Head: .LeLutka. Head.Bianca 3.0 | Makeup: Comes With the Head Hud | Eyes: *Queen oF Ink [Delicious] – Kiwi Eyes | Shape: Mine. I absolutely had a blast blogging for the events I did for October. I am totally sad that October is over, but here is to new months and new posts! There are no bones about it, I freakin love Halloween! It’s a busy month for a lot of creative juices not just from creators, but for bloggers as well. And while I am busy posting blogs, I am also having a lot of fun around the grid. For instance, my Bloodlines family sim has a lot of great stuff going on. We are holding some quests on our land and also we are the home to Silent Hill. I will post the LM to Apocalypse, and feel free to roam around. All are welcome! Happy Halloween Month my pretties! I am focusing on more items from Trick or Treat Lane held by Dark Passions this post. There are some great goodies to grab and each creator has a free gift! You don’t want to miss that, because as soon as the event is over, so are the gifties!
. :Other items to make the look complete:. It’s time for another post from Garden of Shadows: Dark Fairy Tale. I fell in loooove with this outfit! Kinda feeling a bit dark lately, so it’s totally fitting. There are just a few more days left though, so be sure to get your pretties down there! Body: Maitreya – Lara | Skin: Izzie’s – Kayta (Fae)| Head: .LeLutka. Head.Bianca 3.0 | Makeup: Comes With the Head Hud | Eyes: W:6 my white eyes | Shape: Mine. 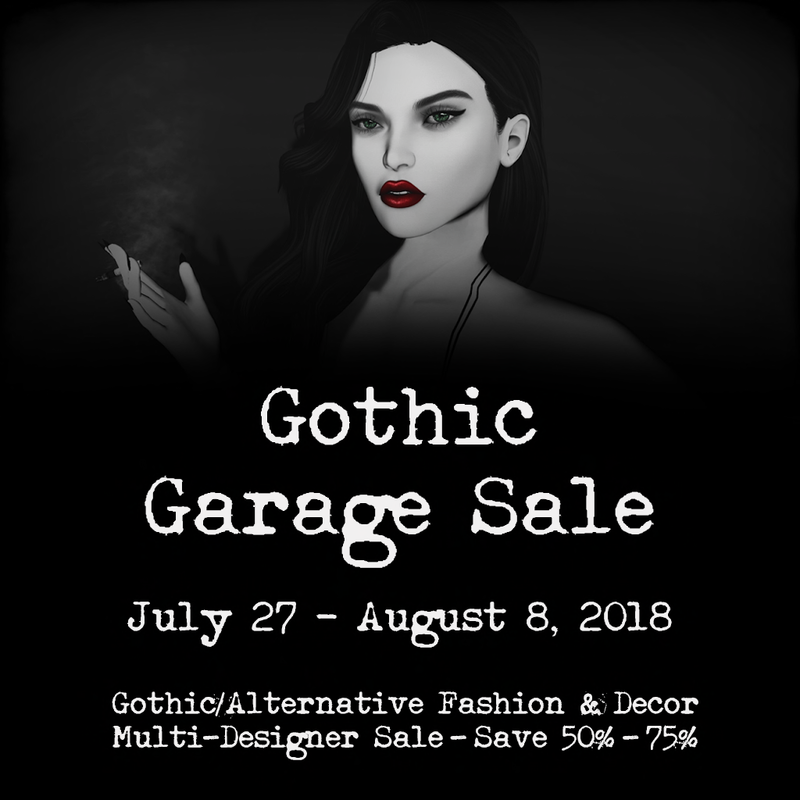 The Gothic garage sale is still happening darklings! There are so many goodies, I am overwhelmed on what to show you next…! I’ll go with some fab decor by Lilith’s Den & [AD] Angelic Designs. Hurry, just a few more days until it closes! I am totally stoked for my new event sponsor, Dark Passions Events : Gothic Garage Sale III. They just started an exciting new round, and from what I have seen, there are so many amazing creators and items out there for low prices, it is almost a steal!. Hop on the train and check it out! Body: Maitreya – Lara | Skin: Izzie’s – Kayta | Head: .LeLutka. Head.Bianca 3.0 | Makeup: Comes With the Head Hud | Eyes: Az… Shadow Eyes @GGSIII – July/August 2018 **NEW| Shape: Mine. Body: Maitreya – Lara | Skin: Izzie’s – Kayta | Head: .LeLutka. Head.Bianca 3.0 | Makeup: Comes With the Head Hud | Eyes: *Queen oF Ink [Delicious] – Kiwi Eyes @Dubai Event July 2018 Round **NEW| Shape: Mine.